Underarm rashes can be an irritating and unpleasant experience. Sweat, constant friction, improper hygiene and bacterial infections are the main reasons for the underarm rashes. Some of the common symptoms of underarm rashes are itching, redness, small bumps, increased odor and flaking. If left untreated, an underarm rash can cause skin blistering, pain and fever. If you are observing a purple rash along with swelling of throat/face, breathing difficulty and loss of consciousness, then consult a doctor immediately as it is a sign of severe rashes. 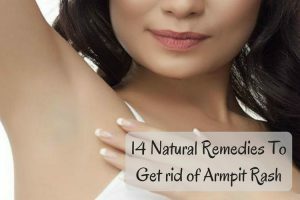 However, underarm rashes without other complications mentioned above can be treated with simple home remedies. Several kitchen ingredients can be used to treat an underarm rash. We have included the best 14 methods with a detailed description below. Apply aloe vera gel on the armpit rash. Leave it on to dry for few minutes. For added benefits: Add a pinch of turmeric into aloe vera gel. The cooling effect of cold compress provides relief from irritation and burning sensation quickly. It also prevents the rash from developing into blisters. Take few ice cubes and place them in cotton towel. Warp the towel and place it on the rash for 2 minutes. Remove for a minute and place it again for 2 minutes. Repeat the process 10 times and let the underarms dry completely before wearing clothes. Follow the process few times in a day. Tip: Wash the rashes with cold water few times in a day and pat dry completely. Caution: Avoid placing ice directly on the rashes. Take 4 tablespoons of coconut oil. Using a cotton ball, apply the mixture on the underarm rashes. Let it sit for 10 – 15 minutes. Repeat the process 2 times in a day until the rash clears. For added Benefits: add a teaspoon of lavender oil or any other essential oil into coconut oil. Take a lemon slice and gently massage it on the underarms. After couple of minutes, leave the juice to dry completely. Rinse with water and pat dry with a soft towel. Caution: Avoid applying lemon juice after you shaving the underarms. Alternative Method: Combine 2 parts of lemon juice and 1 part of honey. Apply the solution on the rashes and leave it on for 15 minutes. Rinse with water and pat dry. Repeat the process 2 times in a day. Baking soda dries out the rashes and prevents them from developing into blisters. It balances the pH levels which makes an inhospitable environment for the infection to grow. Combine sufficient amounts of baking soda and water. Pat dry completely before wearing clothes. Note: You can dust some baking soda on the underarms which acts as deodorant and prevent rashes. Avoid leaving the baking soda application for longer time as it can cause irritation. Hot compress is effective in reducing the itching, burning sensation, swelling and other uncomfortable symptoms caused by an underarm rash. Apply hot compress on the affected areas. Repeat the method few times in a day. Note: You can repeat cold compress after hot compress for added benefits. Vitamin E contains many essential benefits that are helpful for a healthy skin. It promotes new skin cells generation and provides relief from itching. Using your fingers, apply vitamin E oil on the underarm rash. Gently massage in circulation motions for couple of minutes. Repeat the process 2 times in a day until you get relief from the itching. This method is the most effective if you have underarm rash due to ringworm, psoriasis or eczema. The antiseptic properties of tea tree oil soothe the sores, irritation and redness. It restricts the growth of fungus or bacteria causing rashes. Combine 5 – 6 drops of tea tree oil and 1 tablespoon of olive oil (preferably extra virgin). Clean the rashes with water and pat dry. Apply the mixture on the rashes and leave it on for 10 minutes. Repeat the process 2 – 3 times in a day until it looks healthy. The soothing properties of oatmeal provide relief from irritation and itching. It balances the pH levels and maintains the skin moisturized. It also contains anti-inflammatory properties. Add 1 cup of colloidal oatmeal and few drops of lavender oil into your bathwater. Soak in the solution for at least 15 – 20 minutes. Repeat the process daily until the rashes clear. Tip: Use colloidal oatmeal for effective results. This is one of the effective Ayurvedic remedy to treat underarm rashes. Neem contains antibacterial, antifungal, anti-inflammatory, analgesic and anti-irritant properties. Add handful of neem leaves into enough amounts of water. Strain the solution and let it cool down. Wash the rashes using this solution. Combine 5 – 6 drops of neem oil into a cup of lukewarm water. Leave the application to dry completely. ACV contains antifungal and antibacterial properties. It also provides relief from swelling, itching and speeds up the healing process. The acetic acid rebalances the pH levels. Add 1 teaspoons of organic, unpasteurized apple cider vinegar into 1/2 cup of water. Using a cotton ball, dab the solution on the armpit rashes. Leave it on for 5 – 10 minutes and rinse off with water. Note: Being acidic nature, it is better to avoid direct application of ACV on the rashes. If the process is causing any unbearable burning sensation, then rinse off immediately and stop using it. Shea butter contains antioxidant, anti-inflammatory, antifungal and skin-protecting properties which are beneficial for treating armpit rash. Its moisturizing properties reduce irritation and itching. Wash the rashes with antiseptic soap and water. Pat dry with a soft towel. Avoid rubbing the rashes. Massage some shea butter on the affected areas. Witch hazel reduces the redness, irritation and swelling caused by armpit rashes. It also contains antimicrobial and skin hydrating properties. Using a cotton ball, apply the witch hazel on the armpit rashes. Repeat the process 2 – 3 times in a day until you notice results. Chamomile contains soothing properties which provide relief from swelling, irritation and itching. It also restricts microbial activity causing rashes. Dilute few drops of chamomile oil into any other carrier oil. Alternative Method: Apply wet chamomile tea bag on the rashes for 10 minutes. Vitamin C content helps to prevent infections. So, increase vitamin C intake in your daily diet. Applying calamine lotion on the armpits provides relief from itching and speeds up the healing. You can apply the lotion few times in a day until you get complete relief from the rashes. Avoid applying mineral oil or petroleum jelly on the affected areas as it can clog the pores. Maintaining proper hygiene is one of the most effective ways to prevent underarm rashes. Avoid wearing tight fitted clothes as the skin chaffing can lead to rashes. Wear loose fitted clothes as they let enough air circulation. Avoid wearing clothes are allergic to your skin. Stop using chemical based deodorants, antiperspirants or other body lotions until you get relief from the rashes. Stop shaving the underarm hair as it can lead to ingrown hairs and rashes. Opt for waxing instead of it. Drink plenty of water to flush out toxins, regulate body temperature and stay hydrated. Take a cool bath after a workout or swimming and allow the skin to dry completely before wearing clothes. Potassium alum contains astringent and antiseptic properties which kill the bacteria causing the rashes. Apply potassium alum powder directly on the underarms after taking bath. Avoid scratching the rashes as it can worsen the problem. Stress levels can worsen the condition. Perform meditation or breathing exercises to reduce them. Increase probiotic content in you daily diet to prevent fungal infections. Apply calendula or geranium oil on the rashes for relief as they contain antifungal, anti-inflammatory and soothing properties. Was the information provided in the article helpful for you? Do you have any other remedies that work better than the above mentioned? Write to us in the comment section below. What about deodorant after using the remedies?